All Things Dog Blog All Things Dog Blog: Your Pet in Cartoons? 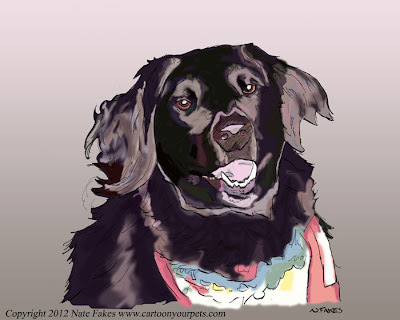 Recently I was contacted by a cartoon artist, Nake Fakes, who was interested in sharing his talent with pet lovers. When I visited his site the first image I found was a dog that could easily have been my sweet Xena. Check out her image here and you'll see; they could have been twins! Ever since losing Xena, I've wanted to have her image preserved in a more artistic way, so here was my opportunity. Nate illustrated Xena as you see above, capturing her essence with beautiful shades and shadows. I could stare at my girl all day, but fortunately still have Tanner and Oliver to cuddle with in reality. Of course, Nate would love to create a cartoon of most any pet you may have. You'll find examples of a parrot, cat, a Toy Poodle and numerous others on his sites. He'll give you options like a watercolor, cartoon illustration or a pen and ink drawing with digital coloring. His sites have samples and options; you'll find your choices for ordering here. What a fun job, huh?!! As a professional cartoonist and illustrator, Nate Fakes also has a soft side for animals. He has recently started a project with the ASPCA in Tampa Bay to help homeless pets, partly by donating 20% of his profits. When you order from him, he'll donate the funds to the Tampa Bay ASPCA or the shelter of your choice. After you peruse these sites I know you'll be drooling over his work. Curious about why I'm reviewing it? You know the drill. There's a giveaway coming. Join me Thursday for your chance to immortalize your favorite pet. Nate Fakes illustrated Xena as a sample for you to see, and me to review. I was not compensated to review his work or share my thoughts, and my opinions are my own. There is no purchase required to enter the giveaway that is coming. Right back at ya! XXOO to Paco! That is so cool! What a great keepsake of your Xena! I love that! I've thought about doing "paint your pet" at Painting with a Twist, but this would be awesome too! Love that picture. It's so beautiful. I looked at his pictures on his site. Does really nice work.